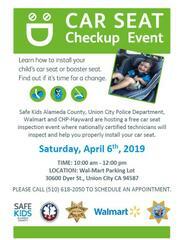 Walmart and CHP-Hayward are hosting a free car seat inspection event where nationally certified technicians will inspect and help you properly install your car seat. Don't just wonder if your child is traveling as safe as possible in your vehicle, know for sure that they are! Come on out to this free car seat checkup event where certified car seat technicians will teach you how to properly install your car seat in your vehicle and verify proper harness placement on your child. We will even check to see if your car seat has been recalled and review next car seat steps as your child grows. Don't spend time waiting in line. Appointments are available at 10:00 am, 10:40 am and 11:20 am. Call (510) 618-2050 and let the receptionist know you want an appointment for the Union City car seat event.